Manteca means lard or butter in Spanish—these cookies were created centuries ago due to a surplus of lard--and, as you can see, is what gives this cookie its name considering the large measurement of shortening included in the recipe. 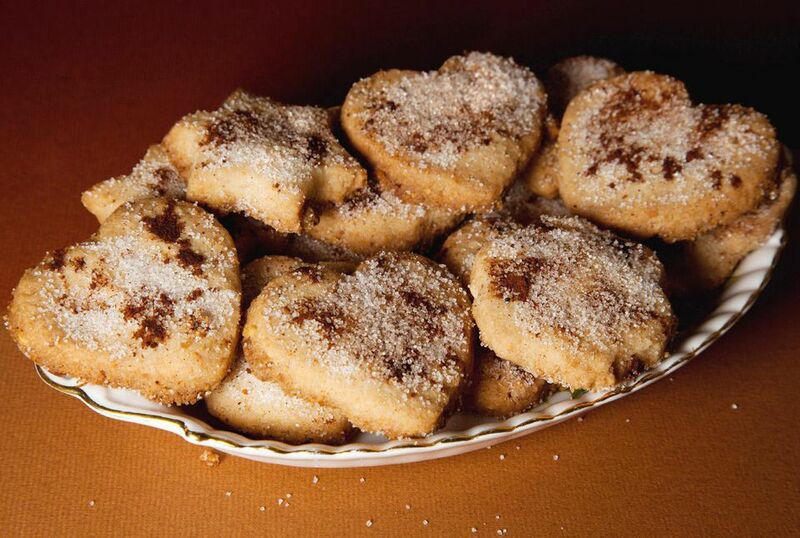 Mantecados refers to a variety of shortbread cookies, including polvorones. This version features a delicate anise flavor accented with lemon and cinnamon. The anise-flavored liqueur can be purchased at most liquor stores and some gourmet supermarkets. If you cannot find it in your area, substitute two shot glasses of vodka and 1 1/2 teaspoons of anise extract. These traditional Spanish crumble cakes, or "mantecados," crumble very easily. In fact, they are so soft and light in texture they will literally melt in your mouth--words will not do them justice. You'll have to make them see why they are a Spanish favorite and why no Spanish home is without "mantecados" at Christmas. In a large mixing bowl, use a hand mixer to whip the vegetable shortening with the oil. Add the sugar and mix until smooth. Add the egg yolks, anise, lemon peel, lemon juice, and cinnamon and mix together. Add flour one cup at a time to the mixture, then add baking soda. Be sure to mix well. The dough should be smooth and soft. Using a teaspoon, scoop out a dollop of dough. Form balls about the size of walnuts using your hands. If the dough is too sticky to roll into balls, mix in additional flour (from 1/4 to 1/2 cup). Place balls onto ungreased cookie sheet. Lightly press down on each ball to flatten slightly. Brush the beaten egg white on the top of each cookie. Bake cookies until they begin to turn light brown on the bottom edges, about 15 to 20 minutes. Let the cookies cool 5 minutes before removing from the cookie sheet, as they are very delicate.